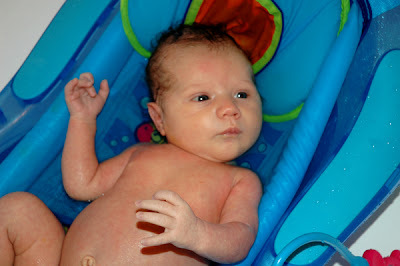 We gave Ava her first "real" bath the other day. 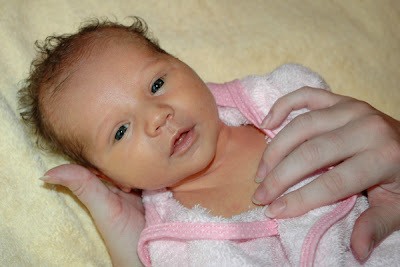 She's had several sponge baths already, but now that her umbilical cord has fallen completely off (leaving her with a belly button that appears to be an outty), we were able to give her a bath in her tub. We thought she might cry when placing her in the water, but she quite enjoyed sitting in her bathtub. I guess we shouldn't have been surprised considering that she did live in liquid for nine months. Even when we washed her hair she stayed calm and collected. Getting a little water in her eyes didn't even phase her; although she did flail her arms a bit. So it's probably just a matter of time before she discovers how to make splashes—we'll enjoy staying dry until then. 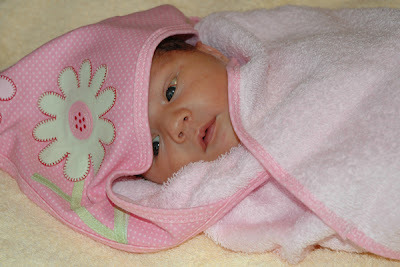 After the bath we wrapped her up in her towel and snapped a few more pictures. We'll post some more pictures tomorrow. I see that we have another little Betsy coming along! Betsy's hair was just like that when we washed it when she was little. Granny O.